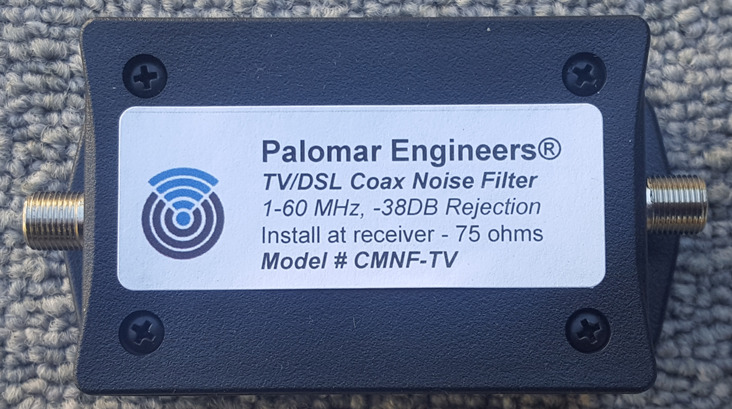 The filter is designed to have a high RF impedance to noise and interference from common mode currents on the outside of the coax braid while passing RF signal currents on the center conductor and inside of the coax braid to the antenna. 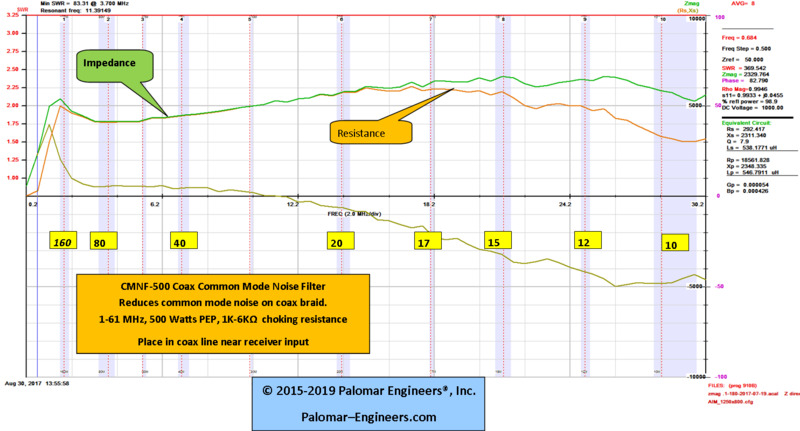 The effectiveness of the filter is dependent upon the amount of common mode noise encountered on the feed line. If your receive system has a large amount of common mode noise current then you should experience a reduction of common mode current which usually as heard as background noise level. Typical choking impedance is shown in the gallery picture. more than the signal so S+N/N improved by 1.9 S units. Enclosure Size (inches):4" x 2" x 1.5"
TECH NOTE: We also stock RFI kits to protect effected devices such as garage door openers, computers (laptops, desktops), dsl/cable routers, ethernet hubs and many more devices. If you run a high powered RF amplifier in your ham station also consider a linear amp RFI kit which will cut down RFI transmitted by your station. Remember there is always a “transmitter” and a “receiver” of RFI and the quest is to find and choke the “path” the RFI has selected – you need to add ferrites to both the transmitting side and the receiving side to eliminate RFI problems. The RFI-HTS kit only helps suppress RFI on the receiving side. Your RFI problem is quite common and is usually a sign of either a radiating coax feed line or reception of your radiated signal (source) by the Direct TV (the victim) through either the AC power lines acting as “antennas” for your ham signal or the coax braid of the satellite antenna acting as an antenna for your signal. These items should help reduce the RFI and let you operate on the air while your wife watches TV.